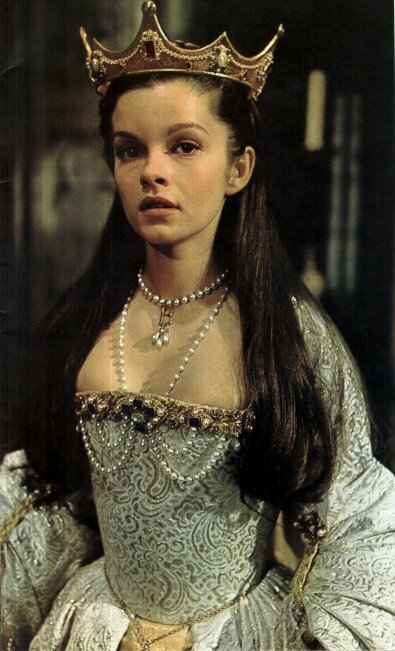 This Throwback Thursday is one of my true guilty pleasures — Anne of the Thousand Days from 1969 starring Geneviève Bujold as Anne Boleyn. 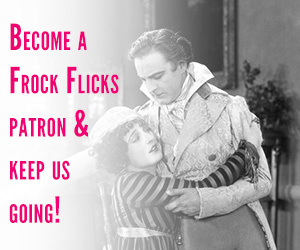 Costume designer Margaret Furse won the Oscar for best costume for this movie, but it’s not like that denotes any particular historical accuracy. Oh those French hoods! Maybe this is why renfaire reenactors make them out of plastic visors — all of Bujold’s hoods stick straight up like a halo around her pretty little face. She is damn pretty though, and she looks stunning in everything, no matter how weird. 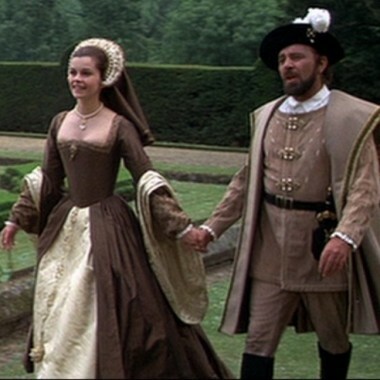 I’m always sucked in by the story and acting of this movie, and the costumes get a pass because Bujold and Richard Burton as Henry VIII can chew the hell out of scene. But upon closer inspection… um… it’s a mishmash. Random sleeve shapes slapped on the dresses, weird fabric and trim choices, jumping around in time, and hair everywhere never dressed and tucked up under hats. Did I mention it’s all very pretty? Crowned queen, can’t afford to have her hair done. Not a care in the world or a historical accuracy in sight. My hood is my halo, St. Anne of a Thousand Visors. I just rewatched this a few weeks ago, and was pleasantly surprised by how damn entertaining it still is! And yeah, pretty. 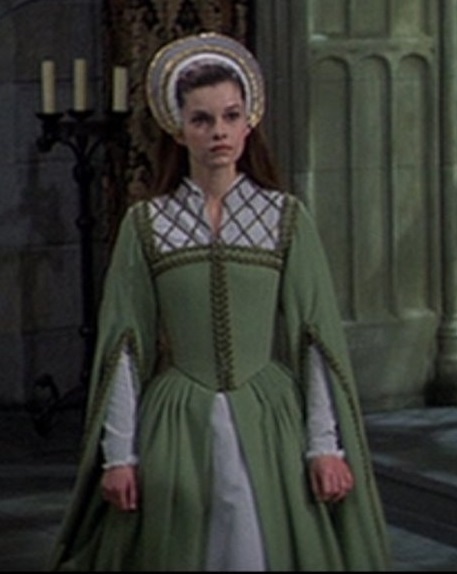 Anne wore her hair loose ( as was the custom) at her coronation so your comment about not having her hair done is rather ridiculous. When she is married, her hair is always covered, according to convention. 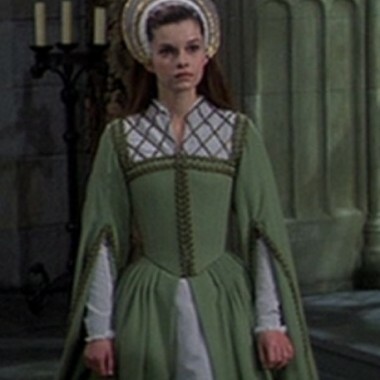 The colours used for Henry were spot on for accuracy – green, red, tawny and black as detailed in Maria Hayward’s book on Henry’s wardrobe. Almost none of those French hoods are accurate – most don’t have the hood portion of the hood. You’d never see hair hanging loose behind a hood; simply not done. A hood is not a headband or a visor. But Anne is the only one with flowing hair, deliberately done by Furze to make her stand out. Perhaps you could point me to where I could see a surviving French hood? One of the problems is interpreting a 2D drawing from a 3D object which is something even Holbein struggles with. I love this movie, it’s the movie that comes the closest to showing H8’s harassment of Anne, and that Anne genuinely wanted to get away from him (she seemed to have fallen in love with him later on, but that doesn’t erase the fact that she was sexually harassed in the beginning). 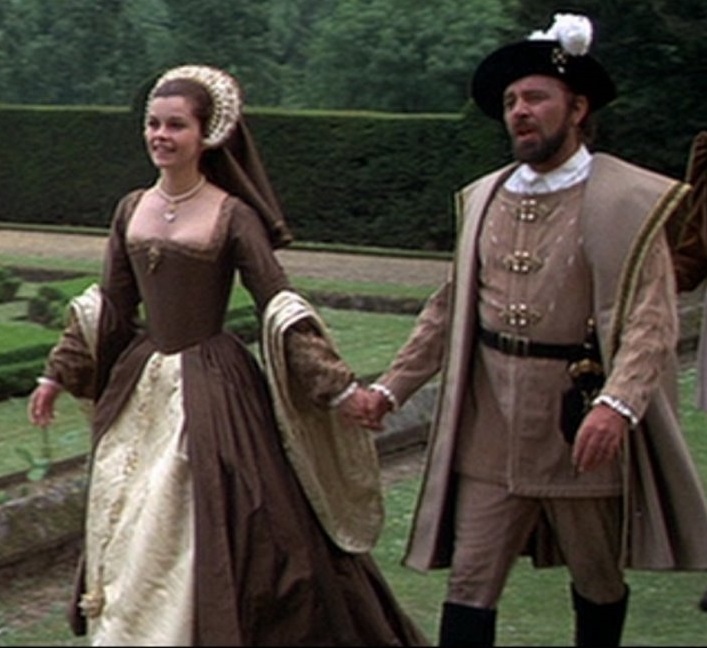 The costumes are also very pretty, and much better than many other Tudor movies, even though the french hoods are more like headbands than proper hoods. 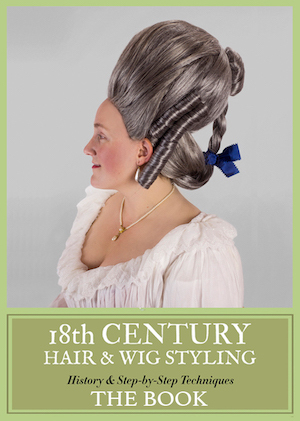 About Anne’s hair, she did wear it loose on occasion before her marriage, since she was an unmarried maiden, and she also had loose hair at her coronation. We know her hair was so long that she could sit on it, and she would also weave jewels into her hair (that’s actually showed in this movie, and it’s so pretty).